Length: 1 hrs. 16 min. 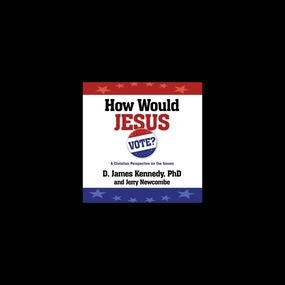 Into this overwhelmingly complex political situation, Dr. Kennedy and Jerry Newcombe bring a clear, compelling, and nonpartisan exploration of what God’s Word has to say on these critical matters. How Would Jesus Vote? isn’t intended to tell you which candidates to support; rather it offers you a Christ-centered understanding of the world to help you draw your own political conclusions. This election, don’t cast an uninformed vote that fails to reflect your values. Instead, learn how to apply your faith and obedience to God to your ballot. This timely, helpful, and hopeful book will enable you to do just that.